Last month, I e-mailed all American Board of Internal Medicine (ABIM) diplomates, letting them know that ABIM “got it wrong” and that we were taking a number of immediate steps regarding our Maintenance of Certification (MOC) program. The response to the announcement has been very helpful. 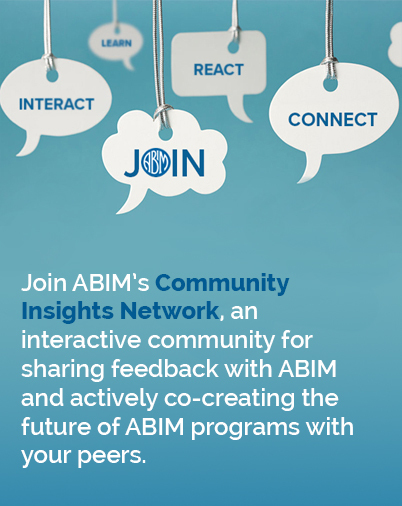 Many physicians have shared their candid feedback about ABIM and its programs with ABIM leadership and staff through blog posts, social media and their societies. I’ve personally had many conversations with diplomates, medical societies and others in the health care community about MOC and our path forward to improve the program and make it more meaningful. Some of these conversations have been difficult; many diplomates are angry about the program and the many other reporting burdens they face. Some conversations have focused on the differing challenges faced by physicians in private practice, health systems, academic institutions and elsewhere, and ABIM’s need to be sensitive to that. I agree. While many appreciate ABIM’s “first step,” everyone wants to know what comes next. What comes next is more listening. A lot more. As I have stated, ABIM’s leadership wants to hear from the community and design programs that physicians find meaningful. We suspended some MOC requirements for at least two years to give us the time needed to listen to our diverse community—really listen—and recalibrate. A shared belief that “keeping up” means different things in different disciplines. A shared sense that defining “keeping up” is the work of the whole community, including physicians, specialty societies, patient groups and health care institutions. That ABIM needs to do a much better job integrating with and recognizing the many high-value activities already happening at the grassroots level and within health care institutions. That the quality of the exam and exam experience must be improved, with some suggestions for eliminating the MOC exam altogether. Some have expressed that ABIM should not engage in any work beyond initial certification, saying that state licensure and/or continuing medical education (CME) should be enough. These formal and informal discussions will continue. We have many in-person meetings and workshops planned over the next few months. ABIM is developing a comprehensive diplomate survey, as well as planning other activities to further the collective conversation of the community. My e-mail last month was the start of an important, ongoing conversation. If I could report to you that we had it “all figured out” within a couple of months, then that wouldn’t have said much about the quality of our listening or the magnitude of the changes we are open to making. We are determined to get it right this time, knowing it will take a while to give diplomates and medical societies the opportunity to weigh in. I very much appreciate your engagement—and your patience.